Just because campers and RVs are made tough doesn’t mean they should be left to rot in foul weather and harmful UV rays. Protect your investment with a sturdy camper cover, RV garage or portable garage kit to be sure your camper is ready when you are. We have an excellent selection of sizes and colors to fit and match your RV or camper. Choose from solid green, tan, gray or white. Heavy duty structural steel frames provide commercial grade strength to withstand high winds, heavy rains and accumulated snowfall. RV and camper covers are all-weather waterproof and have a 5-7 year life expectancy. 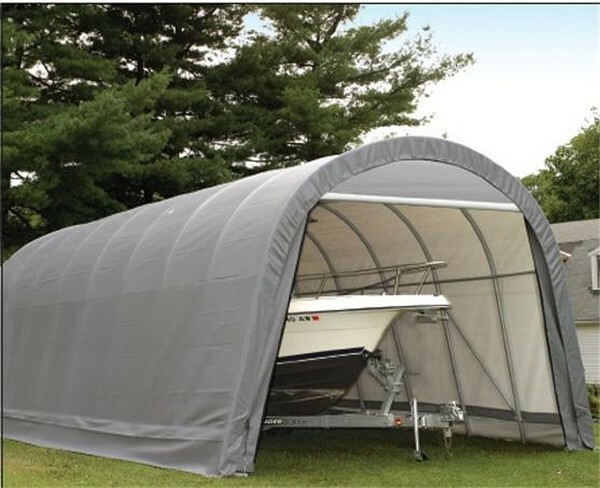 These durable covers feature 4’ spacing between the ribs and/or rafter supports, double-zipper front door entry and its own anchoring system. All fabric components feature heat welded seam construction and have bright white interiors for solid visibility in daylight. Some select RV and camper covers feature a 1-year manufacturer’s warranty but be sure to check the model specifications and review the product details to see which items qualify. 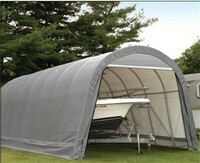 All units include a zippered front & rear door entry and include an anchoring system. Constructed from heavy duty structural steel with sturdy 4’ spacing between the ribs or rafter supports. All-steel Dupont™ thermoset baked on powder-coated finish prevents chipping, peeling, rust and corrosion. Rhino Shield -Every frame tube and connector goes through a proprietary 13 step Rhino Shield surface preparation process. Swedged tubing for slip-together easy assembly. No drilling or field cutting is required. Main Cover and zippered end panel doors are made from advanced engineered, triple-layer, chemically heat bonded enhanced quality weave, rip-stop, waterproof, polyethylene cover. UV-treated inside and out with added fade blockers, anti-aging, anti-fungal agents resulting in a fabric cover that withstands the elements. Rugged Ratchet Tite™ Tensioning System provides simple installation while keeping cover tight to frame. Easy Slide Cross Rail System locks down and squares up covers. High profile white interior provides enhanced illumination. All fabric weight calculations are in oz. per m2. Polyethylene (PE) Heavy Duty: 9 oz. Forest Green, Gray, Tan or White, Brown, and Greenhouse Clear are available. Fire rated FR fabric CPAI 84 Section 6 and NFPA-701 Large Scale compliant. Forest Green, Gray, Tan, Brown or White are available for a custom charge. Remember to add this accessory from the Custom Fabric Cover Upgrade section below to your shopping cart if you are choosing to upgrade to the Forest Green, Gray, Tan, Brown or White 14.5oz material. Remember to add this accessory from the Custom Fabric Cover Upgrade section below to your shopping cart if you are choosing to upgrade to the Hunter Green or White 21.5oz material. Add the custom fabric cover upgrade from the Custom Fabric Cover Upgrades below for the color and grade of material you have chosen so that the correct upgrade charge is added to your shopping cart. Protect your RV, camper, car, truck, SUV, boat, motorcycle, materials, yard equipment, workshops and much more with our instant portable all weather camper storage shelters and covers. Our temporary buildings can be customized to fit vehicles of any shapes or sizes. Portable Garage Depot's affordable all weather portable buildings protect the value of your belongings with the ultimate in weather protection materials. Construction materials are pre drilled and cut to specs. Easy bolt together design, with easy to assemble instructions help construction go fast and easy. Quality materials make for a quality structure that will stand the test of time, while still protecting the value of your belongings. Whether it be your car, truck, SUV, boat, campers, motorcycle, or maybe materials and storage, our portable instant all weather shelters will give the maximum in protection against sun, rain, sleet, snow, and wind. 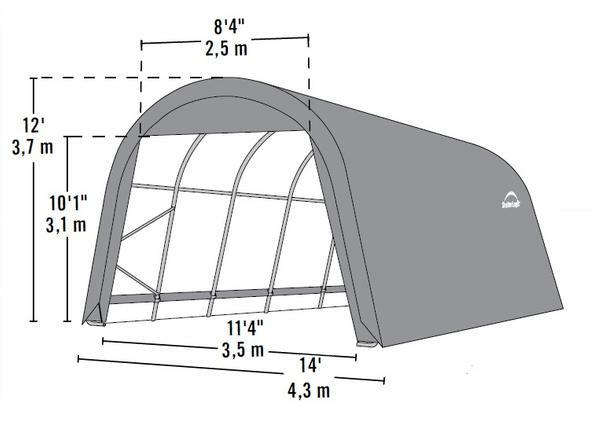 Wind brace supports on all sides will protect from the wind, hard falling rain, or snow that can put a heavy load on your storage cover shelter building. Being that Portable Garage Depot is a leading manufacturer of its own temporary storage covers, buildings, and shelters, we can offer the lowest prices when buying factory direct. Let your number one source for quality storage structures help you choose the right structure you desire when looking for portable storage buildings.